When March finally rolls around after the long winter I am so ready for the Big Tournament it's not even funny. 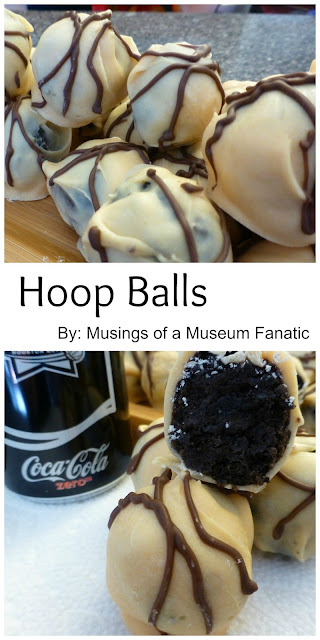 Since Kevin and I decided to take it easy this weekend after my being sick and watch from home I thought I'd basketball-ify one of our favorite desserts ... Poop Balls into Hoop Balls! It worked out perfectly since we decided last minute before we headed to Jewel for our weekly grocery shopping. We decided to pick up some other stuff to make the evening more enjoyable as well, including Coca-Cola Zero™. Jewel decided to rock, as per usual, and both the Coke Zero and the OREOS needed for the Hoop Balls were on sale for great prices yahoo! 1. Start by crushing up the OREOS in a food processor until they're fine. 2. Add softened cream cheese to crushed cookies and mix until combined. 3. Make mixture into about 1 inch balls and put onto lined cookie sheet. Put cookie sheet into fridge for about 15 minutes until balls are firm. 4. While you wait for balls to harden enjoy the 6 leftover OREOS and a refreshing Coke Zero! 5. Melt the white chocolate or almond bark and add dye to make it orange. Even with the amount of dye I used it didn't turn as vivid of an orange color, more of a light peach, as I had hoped but next time I know you need more! Also make sure not to heat it too much, I melted it just a little too much and it started to seize a bit so it didn't end with as nice a ball shape because of this. 6. Dip the OREO balls into the melted chocolate with a fork and shake off excess. 7. Melt the chocolate and then put into a plastic baggie. Cut off a little bit of the corner to use as a decorator. 8. Make lines to look like a basketball. I was going to take a really cute photo of Kevin with the Hoop Ball but as per usual he was just ready to eat and that's what I got ha. VOILA! You've got your Hoop Balls, perfect for your at home night for the Big Tournament or if you need something to bring to a party along with some refreshing Coke Zero to share with everyone. For even more refreshing Coke Zero fun Visit cokeplaytowin.com/tastethemadness for a chance to win NCAA prizes.